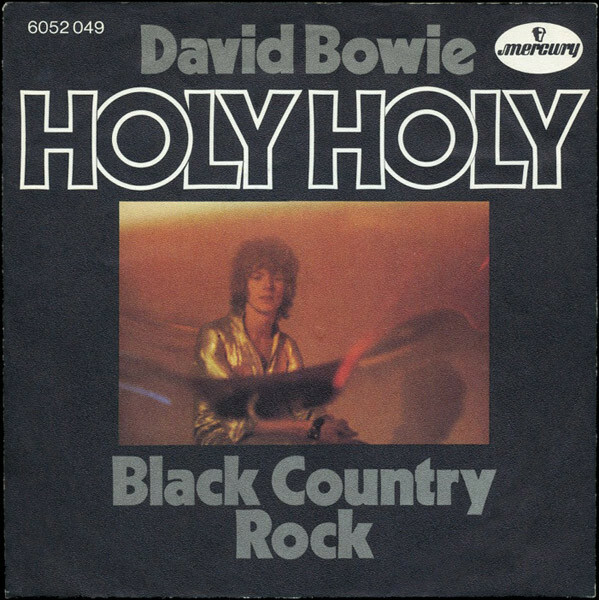 Holy Holy – single, 1971. 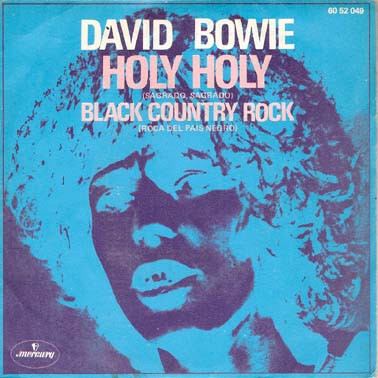 Holy Holy, the never re-released single from 1971, is both a little naive and light, after its near menacing bass-led intro, while quite transcendental in its chorus build up, and held ‘just let me beeeeeeeeee’ singing by Bowie. It’s dominated by Herbie Flowers’ bass, and is unlike anything else in the Bowie catalogue (except for the 1972 remake, if you must be pedantic). It is another minor masterpiece from Bowie’s early, pre-breakthrough years. It evokes kaftans, beads, and hippiedom in a sweet early 70s way, and like a lot of Bowie’s pre Ziggy breakthrough gems, it deserves a whole lot more than the oblivion being a bootleg only cast off, or paid for through the nose if you wish to get a rare official release of it (i.e. the original single, or the one release since on a box set). A *lot* of Bowie singles have emerged in recent years, albeit as picture discs. Not all of us want a Bowie record as a mobile, or to pin it on the wall. How about a picture sleeve re-release of early, ‘lost’ singles like this? London Bye Ta Ta sounds faster and more jaunty in its 1970 incarnation, compared to the earlier 1968 version, although the tempo is pretty similar, just the treatment differs. It has been alleged that Marc Bolan played guitar on this, like he did on the The Prettiest Star. This update of London Bye Ta was originally planned as the B side of The Prettiest Star. Kenneth Pitt, noted his surprise that Conversation Piece was added in its place. Tony Visconti maintains Conversation Piece was recorded as part of the Phillips album sessions. While the latter song is not that dissimilar in mood to the songs on the album that came to be called ‘Space Oddity’, there’s something so mild, mannered, and inoffensive about it that it drifts by a little too pleasantly, lacking the impact, passion, and intensity of the earlier demo (from the ‘Beckenham Oddity’ session). London Bye Ta Ta, like its earlier draft in 1968, evinces excitement in its barnstorming presentation, and is worthy of a proper single release with its originally planned single partner, The Prettiest Star. The Prettiest Star itself sounds wonderful in the stereo mix that was released in the 1990s; and the lack of a single re-release of this ‘lost’ single, makes for another gaping hole in the Bowie singles release programme, in that this version was released on 45 back in 1970, and not on a single since. Instead of the plethora of picture discs that have been released in recent years, how about simple, official picture sleeve releases of songs like this? Prettiest Star in the single cover below has sold from over £150 to over £250 in recent years. 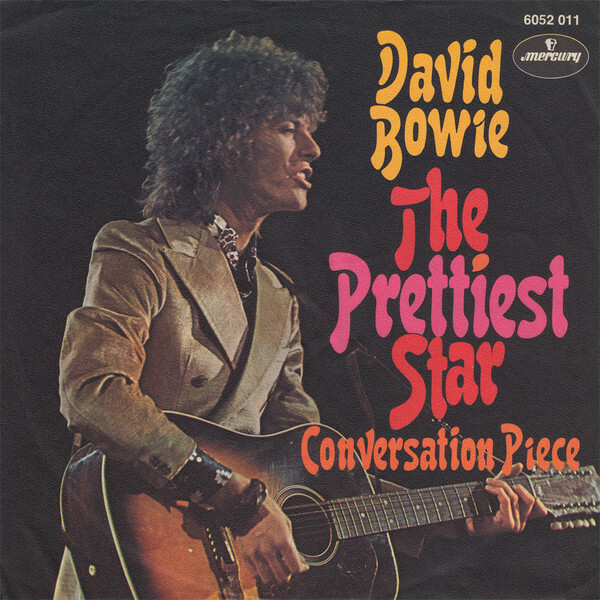 A single release of stereo Prettiest Star with its original B Side, the 1970 recording of London Bye Ta Ta, with Marc Bolan on guitar on both sides apparently, would make for a great addition to the current Bowie catalogue. 2 versions of London Bye Ta Ta exist – the 1968 version, and the 1970 re-recording. Both exist in slightly different mixes too. The song itself is truly a minor Bowie classic in my opinion. It is exciting and joyous sounding pop, with a light lyric about the subject wanting to get away from London, away from the contrary girl he loved. An acetate was made of London Bye Ta Ta in March 1968, along with a song allegedly planned to be part of the centrepiece of a planned second Deram album, In the Heat of the Morning. This acetate recording of both songs was first bootlegged in the 1980s, on a red vinyl 7” single. It has been bootlegged on CD since, and was also finally featured in an inferior mix and inferior sound, and too slow too, on the David Bowie Deram album double CD set. The first version of London Bye Ta Ta, on this single, sounded 100 times better than any CD incarnation so far. Heard properly from the acetate mix on the single, the bass pulses along, the guitars chime, the strings sweep, and the keyboards swirl…it has a vibrancy and energy that demands to be heard! “I loved her! I loved her! I’ve got to get away I know, but I loved her!” David cries in the chorus, his voice shrouded in echo. A lovely, fun tune, that deserves far more than to be tucked away in an inferior mix at the end of a bonus CD. 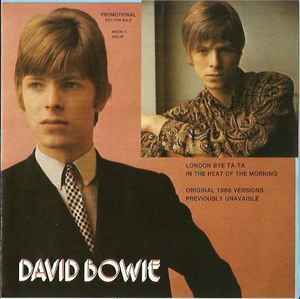 The acetate mix of In the Heat of the Morning is fine, but in all honesty this latter song – which stands equally high as an early classic in the Bowie catalogue – has never sounded better than when it was first issued on the World of David Bowie LP, in 1970. There’s still time for the lack of this great single coupling in the official Bowie catalogue to be rectified, and for London Bye Ta Ta (1968) and In the Heat of the Morning to be given a much deserved official release in the above forms – they would make a great, great, double A-side single release in their own right. A masterpiece of a single, best heard on the stereo Dutch (or Italian) issue of the 7″ single (Philips ‎– 704 201 BW ), by far. The brilliant Space Oddity, few are not familiar with. Whether it’s mastering or mixing differences (some will debate this sort of thing strongly), certain sounds are more prominent on the album version and the 1975 UK single reissue. For those that care about such things differences like that are a bonus / of interest. On the single, you can really feel the guitar, and the cello-like bass. Haunting and beautiful, a more expansive and slightly bombastic take of the song with strings appeared on the subsequent ‘David Bowie’ album (released as Man of Words, Man of Music in the US, and renamed ‘Space Oddity’ on re-release in 1972). Space Oddity allegedly got its first public airing – at least beyond any performances at Bowie’s Arts Lab at the Three Tuns in Beckenham – being played through the PA in Hyde Park when the Rolling Stones played there on 5th July 1969. The single was Bowie’s first bona fide hit, albeit one that did not change his fortunes in quite the way he hoped. Paris Cinema Studios 1970 at the Beeb – the Beeb left off the wrong tracks! David Bowie, Mick Ronson, Mick Woodmansey and Tony Visconti performed this gig on the 5th of February 1970, at the Paris Cinema Studios in London. It was broadcast on BBC radio. Half of this gig has been released on the Bowie at the Beeb compilation. It’s been noted that the band were recruited just before the gig, and Bowie at the time – during the gig itself – hinted the performance could have been better, as have Mick Woodmansey and Tony Visconti, the first of whom both dismissed it as awful. Not true! – all these songs together bring a fascinating insight into Bowie in concert at this time, and are much better than the band members would have you believe. It is a great gig, that is a rare opportunity to hear the embryonic beginnings of the Spiders and the TMWSTW band, as well as Bowie touring the 1969 ‘David Bowie’ Phillips LP, which was later retitled ‘Space Oddity’. The whole gig is worthy of release in its own right, either on a future rarities or further Beeb box set, or even better, on a further expanded ‘Space Oddity’ reissue. On listening through it, it does seem that some of the wrong tracks were left off the Bowie at the Beeb release. The band tracks, in particular, have a gloriously ragged feel – in a good way. While it’s documented that the two Mick’s did not have sufficient time to rehearse a lot prior to this gig, that’s not such a bad thing. The gig has got a relaxed feel for the slow numbers, and a rough and ready feel for the faster ones – it deserves better to be consigned to muddy sound from an old off the air (possibly tape recorder to the speaker) recording. There’s a wonderful grind to the playing as the band gel once they come in after a few numbers… a rough and ready feel to the band sound with Mick Ronson’s raw sounding guitar in particular, and Tony Visconti’s bass and Mick Woodmansey’s stuttering drums syncopating with him is almost jazzy at times – again, in a good way. The influence of the British blues boom there. The gig starts off with Amsterdam, an average version of the song that Bowie performed live often in the early 70s. Next up is a middling run through of God Knows I’m Good, and then he covers Biff Roses’ Buzz the Fuzz. A more well balanced recording from the close to master tape used for Bowie at the Beeb could salvage this number a little … Bowie deadpans where Biff’s mannerisms, and near chipmunk singing, and mix of ragtime and strings had at least lent the late 60’s cops on drugs skit a little more in its favour. Things pick up for Karma Man, an unreleased song at that time. The chorus melody here differs from the recorded version subsequently released on The World of David Bowie, and Bowie belts out the last words of the verses, then soars through the chorus and holds the last note of the song beautifully…this really deserves an official release in decent quality! London Bye Ta has a ska / reggae feel to it here…reggae was becoming popular in the late 60s, and an attendee at the Beckenham Festival in 1969 stated Bowie had actually performed a reggae version of Space Oddity that day. An Occasional Dream is performed gorgeously here, and is a prime example of why this concert deserves a full and complete release. Beautiful lilting bass and gentle acoustic guitar picking introduce the song, and Woody’s light percussive drumming lend it a gentle, entrancing sound. It lacks the flute of the album version, and is delicately placed between the acoustic demo version heard on the Beckenham Oddity bootleg and Space Oddity 40th anniversary release (on the CD only) and the full LP recording. Truly bewitching. The Width of a Circle grinds gloriously, and can be heard in nice quality on the Bowie at the Beeb set. The one thing I think this latter track needs in any full release of this show is a little more bass / feel to the sound, to really appreciate the band’s grind more. Bowie and Ronson and the boys play Janine with a real kick to it, and Mick Ronson’s soloing comes to the fore towards the end of the song – a fun romp indeed! Wild Eyed Boy from Freecloud brings out the band’s grind again as “the mountain moves its eyes”…really nice proto-Spiders raw guitar and spluttering drumming punctuate the build up of the song, and again deserves, like so much of this concert, to be heard properly on an official release. Unwashed and Somewhat Slightly Dazed is another gloriously ragged performance, followed by a running romp through Fill Your Heart, another number by Biff Rose. This latter song is light rock and roll here compared to the more gentle presentation of it later on Hunky Dory. It rolls along very nicely indeed. The last of the ‘bootleg only’ (for now) songs is The Prettiest Star. Performed with a light swing to it, and beautifully lilting lead guitar from Mick Ronson. It is a lovely performance, that like most of the officially unreleased numbers, deserves a full official airing. The last songs of the gig that can be heard at least are an abbreviated Memory of a Free Festival, with organ, preceded by Cygnet Committee – the only other performance of this aside from the album version captured, unless you count perhaps the Lover to the Dawn demo. Waiting for the Man, sadly, was not taped. While some of the songs are less enticing, the concert altogether bring a fascinating insight into Bowie in concert at this time, and is much better than the band members would have you believe. It would be wise to honour Bowie and his vision at that time a fuller hearing with this post Space Oddity concert, and the earlier demos given a full and quality presentation to be enjoyed by Bowie collectors and more casual and curious music fans alike. The Bowie 1969 demos that do circulate are a charming collection. 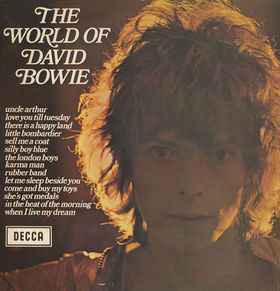 Those that have been heard – on the ‘Beckenham Oddity’ bootleg LP at first, then subsequent re-pressings and online shares – were from an acoustic session with Hutch accompanying Bowie on lead acoustic guitar, and on vocals. While Bowie went on to more popular / populist music, the session that circulates is a wonderful curio, a snapshot of where Bowie was, he and Hutch acoustic troubadours that he had hopes for with the pop-folky set, though his hopes were ultimately dashed, as John Hutchinson, understandably opted for more secure employment when gigs were not forthcoming. The demos, however, helped Bowie secure his contract with Phillips / Mercury, and deserve a far worthier fate than being confined to being heard on bootlegs and downloads in a wonky speed, with reproduction which, while not bad, could be better. As well as the obvious Space Oddity, and Conversation Piece (such a big favourite of mine I have covered this in a separate post), the likes of Janine, An Occasional Dream, Ching a Ling, Letter to Hermione, and When I’m Five are picked, strummed, trilled and sung in a pretty and sensitive acoustic guitar arrangements that are captivating and can whisk the listener to another, seemingly more innocent time of folk music and arts labs, and some of Bowie’s less cryptic, and more open lyrics, often focussing on his lost love, Hermione. Added to the above songs that got released on the later re-titled ‘Space Oddity’ album and the contemporaneous Love You Til Tuesday film soundtrack, Bowie and Hutch also tackle Love Song, penned by Lesley Duncan, who went to make the beautiful ‘Everything Changes’ single and album. Love Song was soon covered by Elton John – he was a big Bowie fan and later said he liked him from the early days, however it’s not known whether he’d been such a fan to have caught Bowie and Hutch playing the song at the arts lab or from any demos or performances by Lesley herself. Life is a Circus and a song that was rewritten to form part of Cygnet Committee, Lover to the Dawn, were also demo-ed at that time. The former, Life is a Circus is a sad and beautiful song, originally by the folk group Djinn, which belies the ‘circus’ of its title. It is beguiling and entrancing, if sombre. Lover to the Dawn features the melody from the verses of Cygnet Committee, then branches off differently into a very pretty call and response duet between Bowie and Hutch. Lover to the Dawn has only circulated on bootleg and downloads sourced from a scratchy and worn acetate. The song can be heard through this wear and tear, however it deserves to be heard far more clearly. An Occasional Dream has been heard from these sessions in a cleaned-up form on the Space Oddity 40th Anniversary CD 2. On the one hand the cleaning up has not removed all ‘warmth’ from the recording as can be the case with such processing, but the bass applied to has made it rather clunky sounding. How pleasant and thrilling it would be to have all these songs, and more, on an expanded 50th Anniversary vinyl set celebrating the Space Oddity album – so the public could hear the genesis of Bowie’s further flowering a songwriter.